The Dolcetto features a large clip that can be attached to a broad range of orchestral instruments including clarinet, saxophone, oboe, bassoon, horn, euphonium, tuba, cello, and contrabass. With an arm that can be adjusted through a wide range of 360° rotation and 180° forward/backward motion, plus a ball joint that allows fine adjustments to the viewing angle, you'll always be able to tune easily, in a natural position. Since a transpose function is also provided, you can smoothly tune your instrument whether it's in the conventional key of C, or a transposing instrument in the key of F, B-flat, or E-flat. 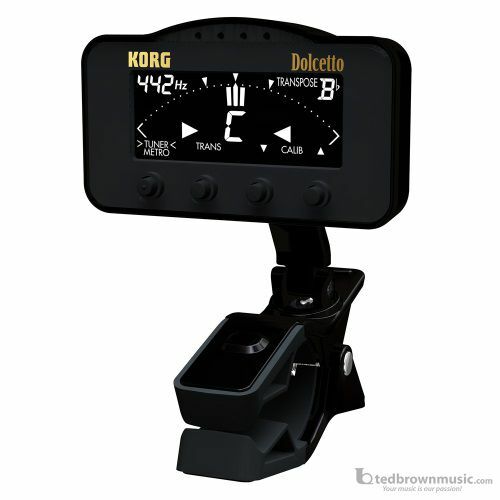 For even more ideal instrumental practice, the Dolcetto series provides a metronome function in addition to its tuner function. In spite of its small size, the functionality includes muting/unmuting and an adjustable time signature, so you'll have everything that you need for rhythm training.